This is a pretty amazing documentary. I just couldn’t stop watching. I really knew nothing about the whole punk rock movement in Africa and how it was tied into a lot of political movements. This documentary talks about that. It’s a fascinating story. Mind you, it would have been nice to have had some background here – because this doesn’t really provide it other than what the bands say in the interviews. But, the story is almost more compelling because you are dropped into it. This is all about interviews and archival footage. There is a lot of great music from a lot of bands I’ve never heard of before. 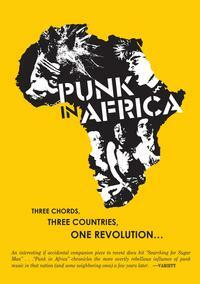 I’d recommend this documentary to just about any music fan or student of African culture. This review is available in book format (hardcover and paperback) in Music Street Journal: 2014 Volume 3 at lulu.com/strangesound.